Class of 1960 Web Page. 4th Row: Robert Renner, Frank Ball, Daniel Handschin, John Detweiler, David Goshow, David Ziegler, James Reath, Anthony Kramlik, Larry Frederick, Thomas Scholl, Edward Funk, John Urich, Andrew Moyer, Weldon Flewelling and Robert Grafton. 3rd Row: Jule Derstine Girman, Loretta Swartley Weitzel, Norma Johnson, Beverly Diehl Clark, Dorothy Freed Kratz, Bonnie Rahn Pribula, Carolyn Moyer Speakman, Marjorie Moyer Taylor, Jeanette Hengey Landes, Ann Alderfer Renner, Linda Bergstresser Moyer, Ruth Ann Greaser Scholl, Grace Treffinger Schultz, Luther Siegfried, Walter Garges, Sandra Davis Weaver, Donna Leister Weiss and Starr Moyer Lichty. 2nd Row: Beverly Benner Mitchell, Sandra Yoder Clemmer, Judith Hager Krex, Elaine Beidler, Willis Delp, Elaine Soeder, Sharon Fenstermacher Kunz, Diane Stevens Gehman, Pauline Fitzgerald Wambold, Dorothy Rogers Weisenborn, Royden Clemens, Edwin Gotwals, and Carl Fuhrman. 1st Row: Bruce Wenger, Richard Hilderbrandt, Scott Moyer, Robert Johnson, Laverne Kratz, Ronald Hallman, Douglas Moyer and Thomas Shelley. 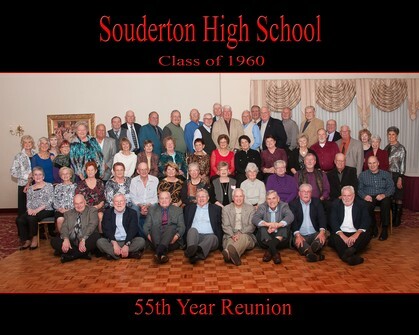 To view photos from the reunion banquet click on the link labelled 55th Reunion Photos in the menu on the left. Click on a thumbnail to start a slide show. You can also add your own gallery of photos by following the instructions at the bottom of the page. "You KnowYou're Getting Old When....."
* The little old gray haired lady you help across the street is your wife. * A fortune teller offers to read your face. * Everything hurts; and what doesn't hurt, doesn't work. * Your back goes out more than you do. * You feel like the morning after when you haven't been anywhere the night before. * You talk about "good grass" and you're referring to someone's lawn. * Getting lucky means you find your car in the parking lot. * Your children begin to look middle aged. * Your idea of weight lifting is standing up. * You know all the answers, but nobody asks you the questions. * It takes twice as long to look half as good. * You sit in a rocking chair and can't get it going. * Your knees buckle and your belt won't. * You and your teeth don't sleep together.